This year will be our fourth out on our own. But it seems like it was only a couple months ago that we were making the jump from a single family living with my parents, gaining our bearings after the divorce. Back then, it seemed so fresh and so new. And while we’ve gotten used to this space we call our own, the novelty of having our own home wearing off, I still find times that I marvel that we’re still surviving on our own. Four Christmases ago, I think I felt the richest I had felt in a long time. In the corner of our living room was the Charlie Brown Christmas tree we had bought on sale at Kmart, the pre-lit branches of the artificial tree decorated with some ornaments we had bought, but mostly with ones we had made. To us, it was gorgeous. Underneath, the boxes of wrapped presents grew slowly, but surely. It was never a large amount, but it was proof that we could create our own Christmas. I admit that we had a little help from some generous souls. One family we were close to handed me a couple large bills to ensure that I could buy gifts for the kids. And another family opened up their trailer so that I could find some toys to give to my kids, and any other kids I knew who were in need. I filled my car, the blessings overflowing as I shared one family’s generosity with several families I knew who were hurting that year. I think my kids would have been happy with one gift from me, but thanks to all the help from those around, they ran downstairs to see our little pile of gifts grow to a mountain of presents they never had expected. It was this little Christmas that reminded me of another Christmas years earlier, when the kids’ father and I were still married. It had been a really hard year for us that year. We had suffered a major hardship, and weren’t handling it well. We were ending that year out of work, out of money, and out of hope. But our innocent children knew no better. To them, every day was a reason to be happy. And despite the meagerness of our surroundings, they wouldn’t believe otherwise – that there was any reason why they should feel sorry for themselves. And on Christmas morning, my three year old daughter woke up to the gifts I had laid out the night before – humble trinkets and small toys I had found here and there for a grand total of $30 – and she turned her wide eyes up to me. “I didn’t think we were going to get gifts this year!” And it took all I had not to burst into tears. She knew she hadn’t been bad. She knew that, by Santa’s rules, she would be on the “good list” – just as deserving of presents as any other child. But it was suddenly brought to my attention that she knew more than we gave her credit for – that things were tight, and that we were going without at times to make ends meet. And she knew that would affect gifts that year. And yet, that was ok, because there was still so much to enjoy about the year. 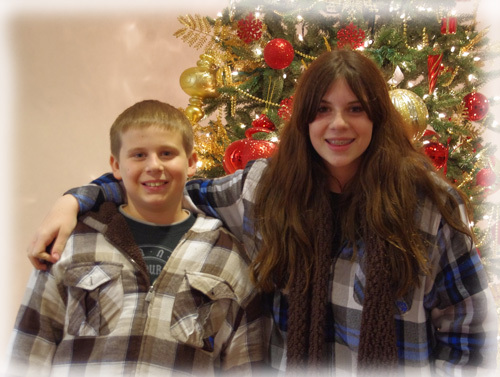 In the years past, the kids and I have focused on different things to make our holiday season special. We take a night out to travel the town, in search of a house with the best Christmas lights and holiday display. We bake cookies, several batches at a time, to give out to family and friends, filling our kitchen with the heavenly smells of gingersnaps and our mouths with the decadent taste of snickerdoodles. Some years we catch a showing of the Nutcracker ballet, our personal favorite being the one that the Sebastopol Ballet puts on each year. Soup has become a winter tradition, warming our insides while the winter rages on outside. Every year there is at least one winter drive up to the snow. And we regularly snuggle up on the couch to take in a movie, pulling out all our holiday favorites. And in these times, I do believe this is the best present of all – the memories we are making every holiday season. The holidays aren’t just about giving gifts. They aren’t just about finding that number one toy of the year, or buying that expensive video game. It’s not about how many boxes are under the tree, or how much in debt the holiday list put you this year. Sure, kids want presents. But what are they going to remember? The time that was spent with them over the season – the traditions that were instilled in them that they will one day be passing on to their own family. This year, don’t forget the gift of your time. As for us, I’m thankful for each and every year we have lived on our own as a small family unit. This will be our final year doing this – next year Mr. W and I are combining our households, mixing our families and creating an all new and exciting adventure together. But for four years, we did it on our own, and had some of the richest Christmases we have ever experienced. You totally made me tear up with this one.